Ukrainian League 2016/17. 7th round. September 9, 2016. Kharkiv. OSC Metalist. Att: 39,677. +15 oC. Paulo Fonseca has fielded almost the optimum line-up for today. The only change occurred on the left flank of midfield. Instead of Taison, who did not have enough time to return from Brazil national team camp, the coach fielded Bernard. This meeting of the two teams who have gathered a full house, is the 50th in Ukrainian championships. The beginning of the match passed at an unhurried pace. The teams tried to launch positional attacks, with the ball mostly remaining in midfield. Nevertheless, by 10 minutes, the Pitmen and Dynamo managed to create one dangerous situation each. First, Andriy Pyatov stopped a great shot by Vitaliy Buyalskyi. A bit later, Darijo Srna fired a header following a pass by Bernard – it was saved by Oleksandr Shovkovskyi. On 20 minutes, Bernard actively played again. However, the Brazilian did not produce a shot, but fed Viktor Kovalenko, whose shot from outside the penalty area turned inaccurate. Donetsk continued to attack, and the same Bernard was targeting the far corner, but Dynamo were saved by their keeper. The Pitmen’s was increasingly more obvious, but an episode on 23 minutes changed the balance of power on the field. The referee saw a foul in the duel between Darijo Srna and Yevhen Makarenko in the Orange-and-Blacks’ box, with Husev sending it home from the spot. The charges of Paulo Fonseca spent the rest of the first half attacking. Kovalenko and Fredhad great opportunities to excel, but on both occasions their shots lacked accuracy. 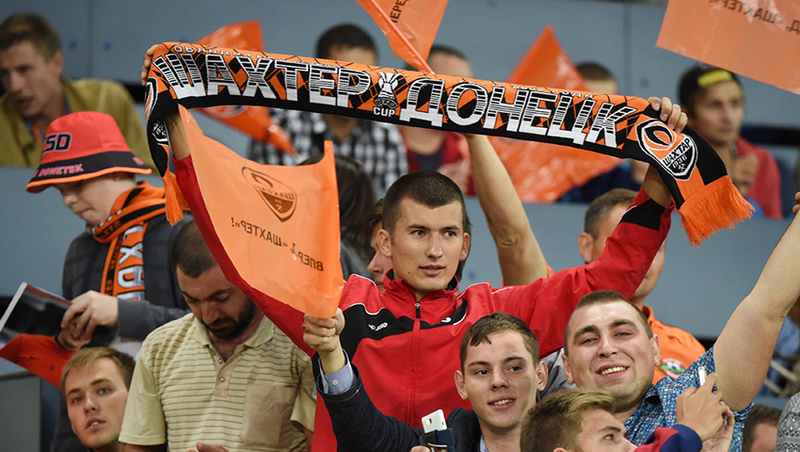 After the break Donetsk fully seized the territorial advantage, while the opponents moved back into their half. On 50 minutes, Fred could have equalised. The Brazilian beat a few defenders at a time only to see Shovkovskyi save his attempt. In the following attack, Facundo Ferreyra headed it, with this game being his 50th with Shakhtar. But the goalkeeper showed excellent reflexes again. Bernard had a pretty good chance after a pass by Srna, but the ball took a different direction from the number 10’s foot. Halfway through the second half, Paulo Fonseca had to make an emergency substitution. Darijo Srna got injured, being replaced by Bohdan Butko on 66 minutes. Shortly afterwards, Dentinho appeared on the pitch instead of Viktor Kovalenko. And this substitution has been effective. 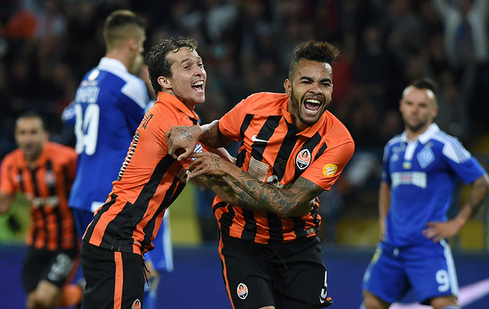 After Butko’s delivery on 75 minutes, the Brazilian headed it home against Dynamo. The Orange-and-Blacks continued to attack, trying to clinch a victory. Wellington Nem who came on forBernard, was active, with Marlos and Ismaily trying to bring danger through dribbling. On 85 minutes, following a high cross, Dynamo defender Vida had a handball in his box, but the referee did not award a spot kick. The numbers on the scoreboard no longer changed – 1-1. Shakhtar will play their next match on September 15 in Turkey. In the Europa League group stage round 1, the Pitmen will take on Konyaspor. The meeting kicks off at 22:05.